Preheat oven to 350 degrees. Grease a 9x13-inch baking dish with olive oil. Bring water and quinoa to a boil in a saucepan. Reduce heat to medium-low, cover, and simmer for 15 to 20 minutes. Mix garbanzo beans, stewed tomatoes, walnuts, raisins, white parts of green onions, lemon juice, chili powder, garlic powder, mint, and cinnamon together in a bowl; stir in cooked quinoa. 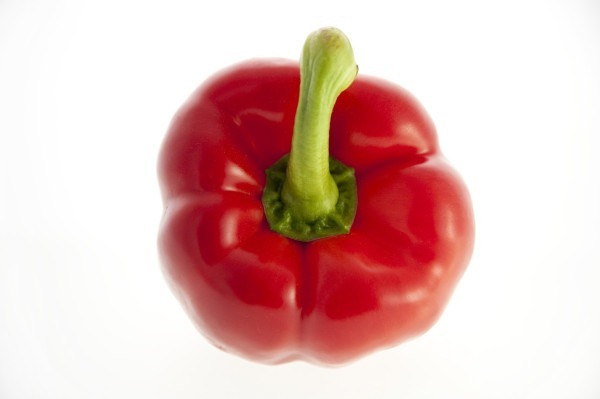 Arrange red bell pepper halves in the prepared baking sheet. Spoon quinoa mixture into each red bell pepper half. Bake until bell peppers are tender, about 30 minutes. Spoon a few teaspoons of drippings from the bottom of the baking dish over each stuffed pepper; top each with 1 tablespoon goat cheese and green parts of green onions.